climate change is here for real, folks. Climate change is real and it's here. This can't be said enough times. This is the synthesis report and it confirms what the sensible folk among us know already: the earth's climate is most definitely changing and we humans are the cause. Once again, Grist has summarised the report in an article by John Light, The 10 things you need to know from the new IPCC report on climate. A couple of points struck a cord in me and should ring alarm bells in Bermuda. First, the sea surface temperature is rising (see graph below) and this will mean "...extreme precipitation events will become more intense and frequent in many regions." Also, a "warmer, expanding ocean...fuels stronger storms." Last month's Tropical Storm Fay, followed six days later by Hurricane Gonzalo, serves as a reminder of this reality. Second, the ocean has absorbed so much carbon dioxide since the industrial revolution hey day that it is now 26% more acidic. This will have an impact on marine life, though scientists may not be sure, yet, what that impact will be. One can't help but consider Bermuda's coral reefs, however. The reefs protect us and must be healthy to do so. The main point? It is imperative that we switch to mostly renewables by 2050 to mitigate this situation, and phase out fossil fuels by 2100. Think about it: 2050 is in my lifetime, assuming a long life, and 2100 is in the lifetime of today's young children. 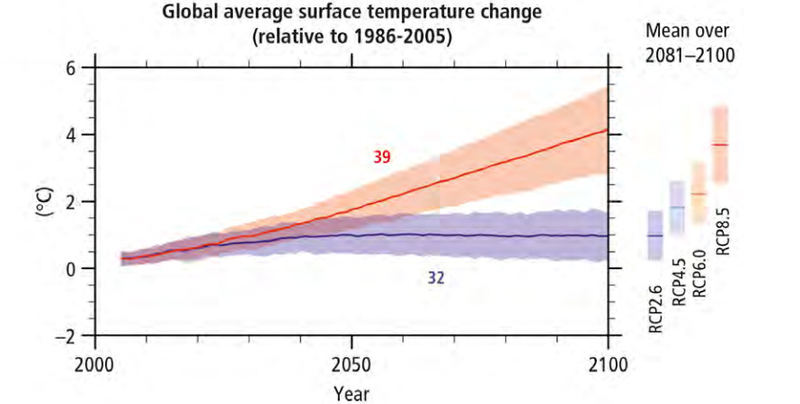 The truly scary part is that scientists posit the IPCC is being conservative. It is worth reading the summary, Climate Change 2014 Synthesis Report Approved Summary for Policymakers. Fortunately, Bermuda is at least thinking about this. The Bermuda Energy Summit, held last week, is the beginning of a conversation, leading to action, that will settle what our renewables future will be. Just in time.